If there’s one well that horror writers just love turning to for inspiration, again and again, it’s the terrors of parenting. Last year was a banner year for the parental anxiety brand of horror, with films like Hereditary and A Quiet Place (not to mention Netflix’s incredible Haunting of Hill House series) finding inspired new ways to explore the well-traversed subject matter. But when it comes to the most popular brand of parental nightmares, there’s no doubt that the evil child subgenre reigns supreme. The latest in the long (long) line of bad seed movies, Orion Pictures’ The Prodigy is a shallow but thrilling spin on the subgenre that benefits from playful, campy interplay with the audience but too often falls to over-familiar plotting and, ultimately, doesn’t have anything new to say. The Prodigy‘s marketing campaign was built around the question “What’s wrong with Miles?”, But the film itself wastes no time answering it. The film opens with a series of inter-cut scenes, spinning two narratives at once. First, an escape — a young woman (horror mainstay Brittany Allen) breaks free from a serial killer in the woods, screaming “He took my hand!” Not too long after, she brings the police crashing down on the man who kidnapped her, and as a SWAT team descends on his hideout the scene, we meet a young couple headed to the birth of their first child. Sarah (Taylor Schilling) and John (Peter Mooney) are expecting the birth of their first child, but he comes earlier than they expected. Cue the labor pains, a trip to the hospital, and ultimately the birth, which just so happens to be at the exact same time the killer is shot dead on his lawn. The camera hovers above his dying body, pools of blood forming in a distinct pattern on his chest, and then one last cut to the baby, covered by little dots of blood in the exact same pattern. It’s a cheeky introduction that sets the stage right away — this cute little baby is inextricably linked to the soul of an evil man. From there, the story jumps forward with a few pit stops along the way. We meet Miles as an infant, who says his first word before he reaches the age of one. Another stop in as a toddler and Miles is officially a genius child, exhibiting early signs of a remarkable IQ. He also has heterochromia, one blue eye and one brown, one of many not-too-subtle nods to the boys split nature about to come our way. While his parents rave about their baby genius with the psychologist, Miles stares menacingly out the window and crushes a bug to death, his doting (and mighty proud of themselves) parents none the wiser. The film settles in when Miles hits eight (played by IT‘s sweet little Georgie, Jackson Robert Scott) when he starts exhibiting disturbing signs of social impairment… or just plain old evil. Nicholas McCarthy is a sharp director who makes clean work of the material, leaning into the chilling silences and dark corners between the film’s more overt scares and wisely putting a lot of faith in Schilling’s performance as the devoted mother slowly realizing the truth about her precious son. Scott is equally good as Miles, vacillating between saccharine and sinister as the scene demands. The script from Jeff Buhler (who also flexed those parental anxiety muscles for Syfy’s Nightflyers and Paramount’s Pet Sematary) is equal parts clever and cliche, playing with the well-established tropes of the bad seed subgenre in a way that invites the viewer as part of the experience. The filmmakers know that you know what’s coming, which is where The Prodigy draws some of its most effective tension. When little Miles picks up a giant wrench and marches towards a classmate, the audience lets out a nervous chuckle because we know how bad this is about to get. 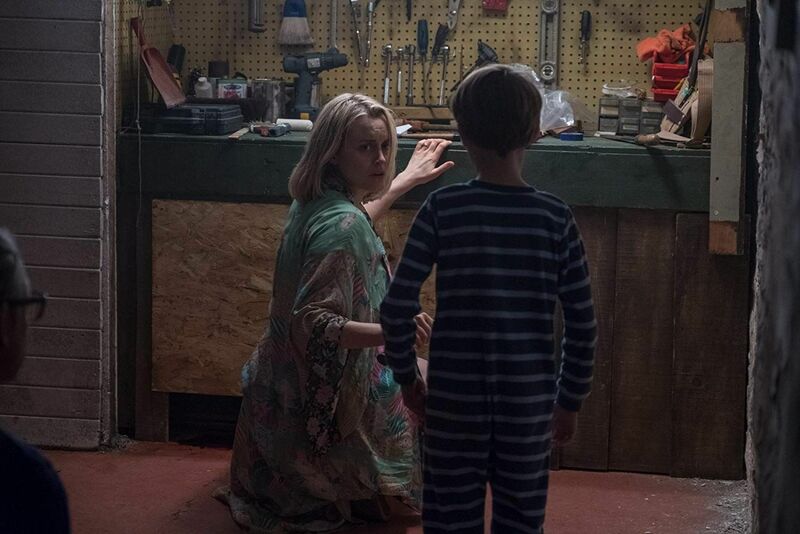 When Miles’ hand creeps down his mother’s shoulder in a shuddersome snuggle, we’re grimacing just as hard as Schilling because we know everything she does and more. Buhler’s script plays its cards early and, for the most part, that works to the film’s advantage, lending a built-in tension into even the most innocuous of encounters and making the really effed-up moments feel ablaze. There are some shock moments so jarring, the audience seemed trapped between a scream and a laugh, which just about sums up the spirited energy that makes The Prodigy so much fun when it dares to be audacious and weird — even the visual jump scares toe the line of knowingly ridiculous. Unfortunately, the film never finds a productive or inspired place to funnel that energy in the end. As Sarah’s journey grows bleaker, it also becomes more obvious, and the big final act showdown ultimately doesn’t go anywhere, culminating in one of the most unsatisfying ending tropes in the genre. Which is unfortunate, because The Prodigy shows flickers of something better, moments of adrenaline-fueled thrills and unconventional jolts that ultimately are just pieces lost in an over-familiar plot. There’s still plenty of fun to be had in the theater with this one, just don’t expect it to take you anywhere you haven’t been before.